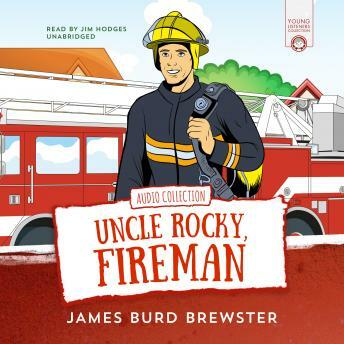 In the 1990s, Jim Brewster put his sons, Ben and Luke, to bed each night with an "Uncle Rocky, Fireman" story. During each story, they enjoyed making truck engine sounds, blasting the siren, and testing the air horn. They also developed hand and body motions and pantomimed getting dressed for the fire. However, the best part of each story was at the end when they mimicked Uncle Rocky as he said, "Glad to do it!" It was great fun then, and we hope as you listen to this audio it will continue as great fun for you and your children. The stories are completely free of any bad behavior, and the characters like and enjoy each other. If you enjoy the stories, please visit Uncle Rocky's website at www.GladToDoIt.net, where you can download free coloring pages or purchase the books for your children's library.